This message was preached by Nigel Pereira at The Glorious Church Conference held in Mumbai in Oct 2014. For the audio please click here. God has always been about saving the nations. He told Abraham that he would be Father of nations. And through history, we see that there is a progression of how it’s taken hold of by different people. First it was individuals taking hold of it. After Abraham, there was Isaac and then we see a Family- the family of Jacob taking hold of the promise. And through him, a people emerged who believed in the same God and the same promise because of which they cry out to God. If God chose them, that he will lead them out of their slavery to the Promise land. God’s plan from then on has been a people- a community. If you ever want to see what God is doing, you look at his people. The world will be reached by the effectiveness of this group of people. And the effectiveness of these people to change the world is decided by a few people who are the leaders that God raises up. A leader was raised- Moses; Joshua; the judges; the kings… God would raise a leader to raise these people. We need to observe the leader who was raised up and the people around him. God’s plan to save the world is through a people and a people are given a leader. David and the people around him. Though we are in 2014, God is still about the same plan. But who are God’s people today? As we look at the people around David, we understand who we are and what we are about. Saul was jealous of David and was trying to kill him and David was running from him for a large portion of his life. And at this time, in 1 Samuel 22:2 we see the kind of people who come to David. 1. God chooses us: God chooses a ragtag band of people. But David established a kingdom which started out here. What are they coming to David for? Because they are distressed, broke, and were in want. But these were the initial days. David was not even a King, but these guys were going to be the nucleus in the kingdom of David. It doesn’t take a great man for God to use him. He uses anyone. In God’s scheme of things, it’s the nobodies who are called. How do we know God chose them? They showed up! They did not know what they were going to become. You and I are the nucleus of something great God is doing and we know that because we showed up. They came to be saved and became ones who will save. God was building through them an awesome kingdom. God chose you for wider purposes with your church. We are at the beginning of something great that God is doing! They gathered to David who was not yet a leader. God is choosing leaders all the time. Though there is Saul, another king is being raised up. How do we know this? 1 Tim 3:1- God puts in the hearts of men desire to lead God’s people. Even as the present leaders lead, others are being raised up. David did not have the best bunch, but they were enough. 2. There is a step up from just being chosen and saved: That is being joined together. A bunch of people who’ve come and give his leadership strong support. God chooses people and joins them to a leader. The kingdom of God is not built without these connections. If there’s a great kingdom to be built, this relationship is vital. There is no shortcut to this kind of leadership. There are times in a leader’s life when people are indifferent- it’s a different time. But later, these same guys get joined to David. Phil 1:3- a community that’s linked relationally- a whole community rises t do something for God. Leaders are related other leader. 3. God Transforms and Uses us: From that ragtag band of people, they become mighty men of David. This message was preached by Pete Harwood,at The Glorious Church conference held in Mumbai 2014. For the Audio please click here. Everyone has a dream- desire to prosper. Many in India are determined to achieve this no matter what the cost. As Christ followers we too can be shaped up by this thinking. What do “I” want to do with my life? What will make me happy, my family happy? So often, we make our own plans and based on our desires, and we forget to ask what God wants me to do. 2000 years ago, in the Roman era, a new time of peace began and travel was easy, everyone spoke Greek so there were lots of opportunities to make money. The Jews were good at business and hungry for wealth. And some of the church members were chasing these as well. James was forced to address this issue as well. James is saying that everyone is acting like they are the Big Boss. But they are not. In verse 13, these Jewish businessmen were making plans for the future. When and where and for how long they were going- what they would do, etc. They were so confident of making money. This was perfectly normal to hear from an unbeliever businessman. James is shocked that believers are talking like this. How do we know they are believers? He would not have this expectation. So Christian Businessmen are making bold strategies for growth. What’s wrong with that? Does James have a problem with making money? No. The problem is that they were planning their future as though God does not exist. We may pray about it but often we have already made up our minds and we want God to bless our plans. We are in control of our lives. Whatever you might think you are not the Big Boss. James tells us that these people not only make plans but are boasting. James uses a rare word for “arrogance” – it’s used for people who think that they are better than they really are. All this boasting is empty because you do not know what tomorrow will bring. You could suffer loss, or get cheated etc. So many things can happen that can affect their plan. James reminds them that they don’t know the future. Our lives are like a mist. What was wrong with these people? Why were they behaving like this? If I ask you today if you have control over your future, you will say, “of course not”. So many unexpected things happen in life and it changes your whole life. No matter how carefully we plan for the future, we don’t know everything that is going to happen. Our lives are over in a few short years. The world will tell you that you don’t need God. Be independent, take charge- go for it, be the boss. But the Bible says that it’s a lie. There is a better way to live. That way is to acknowledge that God is the Big Boss. Trust in God. 1. Acknowledge- Verse 15 speaks about the will of God. The Bible teaches us that God is in control. Proverbs 19:21- “Many are the plans in a person’s heart, but it is the Lord’s purpose that prevails” The Old Testament teaches clearly that nothing happens unless God allows it. Paul says in 1 Cor 4:19- “if the Lord wills…”. Paul acknowledges the will of God. He does not sit idle but makes bold plans but acknowledges that his plans are in the hands of God. God is sovereign- whatever plans we make will come to pass if God wills it. 2. We need to embrace God’s will for our lives. “So whoever knows the right thing to do and does not do it, for him it is sin”. These businessmen James was addressing to, knew the truth but were not living it out. Just praying about it is not enough. Lay hold of God’s will for your life. God in His mercy has made it easy for us. Inspite of our rebellion he reached out to us in love. He sent his son Jesus to come and live amongst us, to die and reconcile us to God, to bring us back into a relationship of dependence. When we do this, it’s the beginning of a whole new lifestyle. We do not believe in Jesus and continue living life as usual. We are living out our life unto Christ and living as an example. Q. How do we know what God wants us to do? This question has vexed more Christians than any other question. We tie ourselves in knots trying to find out. We spend too much time thinking on what God has not told us to do rather than focus on what is clear. Read the Bible, learn what pleases him and ask the Holy Spirit to help you live it out. It sounds easy. Often these decisions are not directly addressed in the Bible- What job, where do I live, who do I marry? We mustn’t allow fear of making mistakes stop us. God loves us so much that he will redirect our path. This message was preached at The Glorious Church Conference by Steve Oliver in Mumbai. To listen to the audio please click here. I asked God to give me insight into what awaits us. I have four things. 1. We are entering a time where God is going to ask you to lay something down to pick up something else. If your hands are full then you can’t take up to her things, This has already started happening. Be encouraged to say “yes Lord” because he will entrust you with more. God told me to lay down the church in South Africa. And in the next month I was called to Dubai. 2 In the next few months God is calling us to sacrificial honouring of one another. Be more conscious of what is happening in others lives than your own. If we are fore warned it’s easier to take those steps. It’s an honouring of one another. 3 In the months ahead God is asking you to let go the supports and walk in confidence. He will ask you to do things that will need big faith- big steps of faith. Some will be asked to do big things and I want you to remember the God’s grace is there for it. 4 For those who are serious about God there is going to be a significant harvest for you. I believe you will enter a very fruitful season. Isaac was set on the purposes of God, There was a famine but in faith he planted and God gave him a hundred fold. So even these 4 things I pray that it will produce much fruit. 1996 we left Cape Town and we moved among the Basotho people., All we had was a prophetic word and faith that God would do what he promised. I had very little training. I would pray “Lord help me “. We had no friends nearby so it was lonely. One day I spent time in John chapters 13-16. This became my training manual for me – a manual of instruction that shaped my life a great deal. I want to take you through 10 things that Jesus taught me and it’s a foundation on which I built the church. John 13 is the final chapter of Jesus life with his disciples. He knew that the cross awaits them. So he gives them final instructions in these final moments. He prepares his disciples for what is about to happen. The salvation of millions depends on how we respond. Jesus begins by modeling what every leader should be able to express by our lifestyle. Jesus washed the disciples’ feet and he models a lifestyle of love that can never be equaled. He shows them the full extent of his love. All we will do form here on has to be out of a lifestyle of love. It’s not about me, what I can get. We will be measured by the love we have for one another. Jesus shows them as they out that it must be out of a place of truly loving one another. Love the people. Love one another. 2. JOHN14 DO NOT LET YOUR HEARTS BE TROUBLED. In a short time we will spread across this nation and the nations and we have to learn to live without troubled hearts. Trust in God. We live with the most assured future. Jesus has gone before us and prepared mansions for us. The disciples have walked with Jesus for a few years and now he was preparing to go. Do not let your hearts be troubled is what He said to them. To see the world changed we have to live with the assurance of what He has done for us. 3. JN14:12 ANYONE WHO BELIEVES IN ME WILL DO WHAT I HAVE BEEN DOING. Really? He will do even greater things because I am going to the Father. How is this possible? V16 I will give you a counselor who will be with you forever. This is the greatest thing Jesus said. Our task is enormous. I then remember this – The Holy Spirit will be with us forever. He will never leave us. He walks with us. This very representation of Jesus himself. The very presence of heaven was right with us – whom we could feel, touch, and smell. WE need to get used to functioning with him. God has given us each other and the Holy Spirit. We must not forget this. We have to encounter the Holy Spirit and know He is with us. 4. JN14:23 IF ANYONE WHO LOVES ME THEY WILL OBEY ME AND MY FATHER WILL LOVE HIM AND WILL COME TO HIM AND MAKE OUR HOME WITH HIM. We create a household out of our obedience to Christ. We create a heavenly household. “God comes to board with you” J Wesley. These can be pressurizing times. 5. v26 THE HOLY SPIRIT WILL TEACH YOU ALL THINGS AND WILL REMIND YOU OF ALL THINGS This does not mean that we throw out what God has said. If you are serious about God what God has said to you in these days, he will remind us about it. We go out there is on one who will remind us. 6 .JN15:16 YOU DID NOT CHOOSE ME BUT I CHOSE YOU. What words those are! He has appointed us to bear fruit. 7. 15:26 HE WILL TESTIFY ABOUT ME. Jesus goes before us. If you are not seeing growth ask God to go before you. 8.16:13 HE IS PREPARING HIS DISCIPLES. WHEN THE SPIRIT OF TRUTH COMES HE WILL GUIDE YOU IN ALL TRUTH. If you want to live according to the SpIrit of God, live according to word of God. Our conscience is our greatest gift. The Holy Spirit fellowships with our conscience. This way we will know what is right and wrong. We need the spirit. I love praying for people because I know how much good it will do you. 9. HE WILL ONLY SPEAK WHAT HE HEARS AND HE WILL TELL YOU WHAT IS TO COME. People end so much of the time trying to find out about the future. But we have one who will tell us what is to come on a daily basis. When someone prophecies and it resonates in our hearts the spirit will show us what is to come. This comforter is there when you are troubled – to comfort us. 10. HE IS ALSO OUR ADVOCATE. HE STAND FOR US AND GIVES US THE HUMILITY TO NOT FIGHT BACK. We need to be people of the Word and Spirit. Jesus instructed his twelve and then he said as he broke bread. We do it in remembrance of Him. This message was preached by Trevor Pyane at The glorious church Conference held in Mumbai. When Jesus has something important to say, he says ‘verily, verily’. When he wants to explain something he says it twice. So we’ll talk about the transfiguration and the Glorious Church. Luke 9:32- Peter and his companions went to sleep! That’s incredible. They had just walked 9000ft up the mountain. They must have been tired. The gospels don’t tell us who woke up first, but they woke up with a start and woke up the others. There before them was a familiar face but it was the most glorious scene. The gospel writers find it hard to describe that moment. His clothes were dazzling white- Mark describes it as bleach white. Luke says his face was shining and clothes were shining. They are trying to describe something indescribable. Matthew says his face shone like the sun. Even Paul on the road to Damascus was blinded. Acts 22- a bright light from heaven that eclipsed the mid-day sun. On Patmos, John saw Jesus- the same radiance- Revelation 1:6. His face was shining like the sun in all its brilliance. Nothing can compare with the glory of Jesus. Such brilliance- how far do you think it could be seen? People down in the fields could see it and fishermen in the sea could see it. One day everyone who has ever lived will stand face to face with that glory. The three disciples saw it. John says ‘we have seen the glory of the one and only’. Verse 31 tells us what they were talking about, about Jesus’ departure. Elijah, Jesus and Moses were talking about his cross, the ultimate sacrifice- his death. The book indicates that this was a long conversation and Peter, James and John were listening in. This was Jesus, their rabbi who walked up the mountain with them, their friend and now he is talking to Moses who was dead 1400 years ago and Elijah 900 years ago. Is ever there was a time for silence, this was it. Jesus did not come to abolish the law and prophets but to fulfill it. He must have been explaining to them fulfillment- fulfillment of every Messianic prophesy from the ages. Just to hear a fragment of that conversation!! But not for Peter- he had to say something. He was babbling- he was so frightened. How did Jesus answer Peter? With, nothing. And then a cloud came. The cloud was always a symbol of the manifest presence of God. The same cloud that led the people of Israel, that Moses walked into, that filled the Temple, that Ezekiel saw lift off Jesus and depart to Babylon. It had not been seen in Israel for 600 years and now it came upon these 6 people- to say that now the manifest presence of God is back on the earth. Now peter keeps quiet. The shekaniah glory came. They heard the voice of God in that. In Psalm 29- David tries to describe God. It’s thundering and powerful. When Elijah heard it, it was still and small. “This is my son whom I love, listen to him”. Same voice was heard at the baptism and John 12, where it says the same thing. Some say it thundered. It was not something in their imagination. It was an audible voice of God. Years later, Peter describes it in this way- 2 Peter 1:16- this is a command to the nations. All this was a partial revelation. Now the time had come for the last words. Hebrews 1:1-2 Jesus is the ultimate truth and the only voice to be heard. A few days earlier, Peter argued about the necessity of Jesus’ death. Then Jesus comes and takes them by the arm and says ‘Don’t be afraid’. At a moment of great revelation Jesus bends down and comforts them. At that moment the cloud, Moses and Elijah and the radiance was gone. And there He was, Jesus- but they would never look at him the same way again. Jesus took them up the mountain for an encounter, to inspire them and encourage them so that no matter what happened, what difficulty they faces, etc. they knew right inside that he is with them and he is the King of Glory. That call- to live in the light of glory of Jesus. This should be the personal experience of everyone. Towards the end of his life, Jesus was in the feast of tabernacles. As part of that festival, each corner of the temple courts had 4 big golden candles that had bowls of oil (65 ltrs) and these were lit. This illuminated not only the temple but the whole of Jerusalem. It was the festival of lights. One morning Jesus came just as the wicks were being snuffed out and said “I am the light of the world”. God wants us to grasp another vital aspect revealed in this story. 1. Those disciples really needed a revelation of Jesus and who he really was. But they needed another revelation. 2.Who they were in Christ- as the gathered people of God- the glorious church, because the splendor of Jesus is what he wants to display in us. Jesus is speaking to us. You are the light of the world. God wants us to have a fresh revelation of how beautiful we are to Him. We are the ones he came to win for himself. His beautiful, radiant bride. Heb 12:2-4 for the joy set before him, endured the cross. We the bride, the church gathered to himself clothed in might, cleansed by his blood. Its time for the church to wake up! Do you know how beautiful you are! The splendor of the world,that we should take that radiance wherever we go. John was allowed to see the full glory of the church in Rev 21. Two years ago, we met together. Thank you for the work you are doing for gospel advance. Our work in the nations is growing but what brings great joy is the maturing among you and fruitfulness. In UK we prayed for Orissa, UP and it’s wonderful to see relationships growing between nations. I am very grateful for Nigel, Lisa and Sabelo coming from Cape Town. Matthew 17:1 – Felt God is going to reveal Himself in a new way. How we position ourselves in relation to God will affect/ determine how we receive from Him. Matthew the tax collector many years after, records this in the gospel. This message is about you- about Jesus wanting to do something for you. Many people followed Jesus but He took these three. He wants to speak to you as an individual and not as a movement. In verse 2- there on the mountain he was transfigured. The sun radiates and gives out light. His clothes became as white as the light. And he is talking to Moses and Elijah. Then a voice comes down from heaven. “This is my beloved son, listen to him”. And Jesus comes and touched them and when they looked they saw no one but Jesus. Though I want to talk about a personal encounter with God, even right now, you can take a heart attitude saying ‘this is for me’. A personal encounter by his spirit will transform your life, the way you live, beliefs and the fruitfulness in your life. Paul wrote “the Lord is Spirit and where the Spirit of the Lord is, there is freedom.” I want us to know that freedom. John said the Spirit gives life. The words I have spoken to you are full of life. If we have encountered Jesus by the spirit, we will go out and do great things. When we encounter Jesus in spirit and truth it will change your life. It changed David from a shepherd to a King in waiting. Q. why did Jesus want these three with him? When we understand this, we will understand what God wants of us. Jesus wanted them to witness this to be his witnesses. Jesus knew that these fishermen would one day before the most fearsome political leaders and they would have to give an answer. He knew that they would have to preach before thousands. He knew that they needed a foundation for them to be fruitful in the nations and give an answer to the people. Unless they had a real encounter with his spirit, they would falter in their faith. Jesus knew they would suffer. When you know who you are, it settles things in your heart. If we have to fulfill what God has called us to do and go on and do great things for Jesus, then you need to have an encounter with Jesus himself. Do you realize that each one of us is a rescued person? Rescued by Jesus. Everyone of us has been rescued from a lifestyle of death. We need to see how needy we are. When I encountered Jesus the first thing He showed me was a heart that was in a mess. We often don’t want to deal with those things. Look at Peter – how much God has to deal with him before God could use him. Experiences that we have in our lives damage our heart and our inner man. But in his presence healing comes. We are called to be a people of Word and Spirit. When he encounters us he gives us heart for people on the streets, cities, villages. When you see the love of God it changes you. Jesus is looking for you and I to press into his presence. After healing you, Jesus envisions you and empowers you. God chooses us to be fruitful. What does God have for you? What has he promised you in the years to come? How many young couples are ready to change the nations and God can change your life tonight and bring healing tonight. God changed Peter James and John forever. This is for you tonight. All God is saying is will you come. Read the Bible and read biographies – full of stories of people who did great things for God. 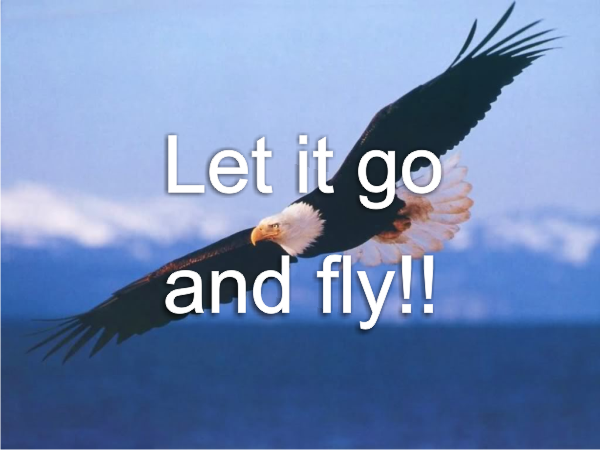 Let it go and fly!!! This message was preached by T D Jakes titled "let it go". We felt this message is foundation to the christian faith, the life of the church and to us realizing our destiny. Everything comes out of your heart. The mind is the ground where seed is planted – both good and bad. Forgiveness is amazing. We don’t talk about it but it is foundational to our faith. We have been forgiven but we find it difficult to forgive. We have to be a conduit through which his character flows. God will give you anything to you that He can get through you. Forgiveness is not for little people. People who do big things are separated from the little people based on how they handle problems. They always take the high road. Chickens eat off the ground – they eat anything including their own feces. Feces is what you should release. If you keep eating what you should release it will weigh you down.To be promoted to the next level, you can’t keep eating off the ground. You can’t go over old issues. Unforgiveness keeps you in the chicken coups when God is calling you to the mountains. Only humans kill because of hate. Not animals. Therefore our emotions control our behavior. Whatever controls you becomes your master. Your memories, scars, pain, abuse is your master anytime it controls. Anytime somebody walks into the room and your mood changes you are a slave. Unforgiveness is not in babies. It is not in children so how do we get it? There is a pathology that is developed in your house, environment culture where you learn to express emotions in a certain way. So it is a learned behavior. What does un forgiveness do to the person who violated you? NOTHING!!! Never have trouble releasing that which you don’t care about. Un forgiveness is a cancer that is eating your destiny. Your history can ruin your destiny. God has great plans for you but he can’t give you for future if your hands are full of the past. Therefore you have to let do, don’t wait to fix it, straighten it out, wait for them to apologize. Anytime you have for them to do something you have put power in the hands of the perpetrator. That is like living in you room but putting the thermostat in their house. Why do you let them have control over your atmosphere? Jesus did not for to the cross and bind up all the forces o f hell for you to be bound up by “Jimmy”! Its time to take back your authority, claim where you are going and fly. Let it go!! If you don’t break it off your history will show up in your destiny. You can forgive people when you understand them. We have not made a distinction between weakness and wickedness. They might have been weak but not wicked. Something people do to themselves and you just get caught in the middle of it. You are a victim of their weakness and how arrogant if you to act like you have no weakness of your own. Therefore you can’t afford not to be forgiving. Blessed are the merciful. When you ask for mercy it means you are guilty. But if you are not guilty you ask for justice. Justice is for the innocent. When you are guilty you pray for mercy. If we have received mercy how ca n we not give it? Our excuse for not forgiving is that they are guilty!! But so are you!! Physical wound can be treated with medicine. But what’s happens when your soul is bruised, yourself esteem? These are the wounds for which the world has no remedy. So we hide our pain. Some do it with drugs alcohol. Some do with church. Church becomes your drug of choice. It’s not where you worship. Jesus did not say I have come to give you church but life in abundantly. This is not a tranquilizer to induce some spiritual euphoria and go home to a hell. The only thing stopping you is that you are using faith like a narcotic and not a liberator so that it can empower you to simply let it go!! !